Over the last few weeks, Senators have begun meeting with Judge Brett Kavanaugh to discuss his judicial record and Supreme Court nomination. The NAACP Legal Defense and Educational Fund, Inc. (LDF) believes Congress must take seriously its responsibility to ‘advise and consent’ on judicial nominations but holding these meetings without access to Judge Kavanaugh’s full record makes for a hollow spectacle. 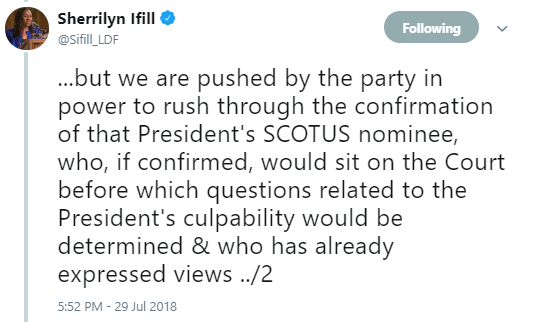 They need access and time to adequately review all documents, emails, statements, and other paperwork that might shed light on how he’d rule from the highest court in the land. Judge Kavanaugh has nearly 300 D.C. Court of Appeals opinions, including 188 majority opinions, 52 concurrences, and 57 dissents to consider. 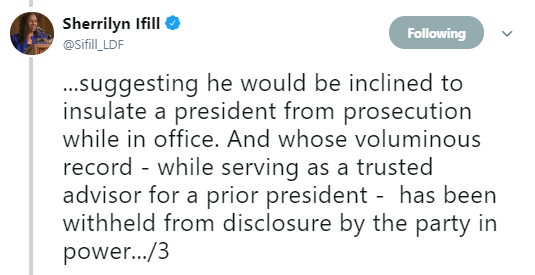 This doesn’t even include other documents from his years as Bush’s staff secretary and in the White House counsel’s office, possibly totaling millions of pages. In fact, in response to Senate Judiciary Committee Chairman Charles E. Grassley’s (R-Iowa) request for 900,000 pages of documents, the National Archives said it wouldn’t be able to produce the documents until the end of October. For their own political gain, Senate Republicans led by Mitch McConnell have made clear their intent to hold a nomination vote before the Supreme Court begins its next session in October. By ignoring the growing mass of legal challenges facing the Trump Administration and casting aside their responsibility to diligently scrutinize the records of any judicial nominee, Senate Republicans are succumbing to pressure from the Administration to appoint judges with unclear and even dangerous views on civil rights. Judicial nominees, especially to the Supreme Court, should be meticulously vetted. 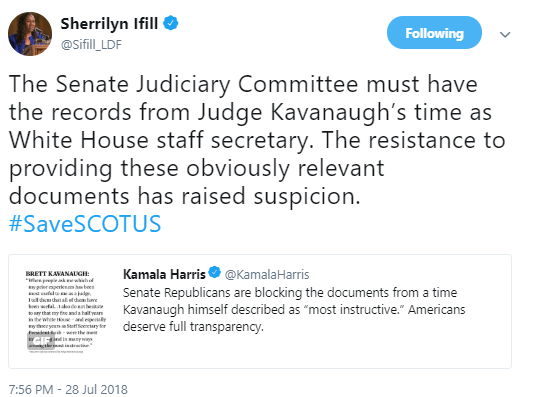 Recently, Sherrilyn Ifill, LDF President and Director-Counsel, shared her views via Twitter on why having a complete review of documents authored by Judge Kavanaugh over the entire course of his career is critically important. An initial review of Judge Kavanaugh’s record indicates a troubling and expansive vision of executive power. Judge Kavanaugh has argued that indicting a sitting President would violate executive power and advocated the President be legally exempt from personal civil suits and criminal investigations while in office. Because of those views, Judge Kavanaugh’s nomination could very well influence the outcome of Special Counsel Robert Mueller’s ongoing investigation of potential criminal activity by members of the President’s campaign. For example, the President has asserted that he has the “absolute right” to pardon himself. It’s clear that the President is doing his best to handpick someone who may ultimately decide his fate. A position that is incredibly dangerous during this current President’s tenure. Senators must be given the chance to critically evaluate Judge Kavanaugh’s record to determine whether he would defend the hard-won rights of African Americans, women, and members of the LGBT community or whether he would rollback critical civil rights protections. The expansion of civil rights has been a hallmark of the Supreme Court for the last 78 years. Judge Kavanaugh’s nomination could set in motion a dangerous and drastic reversal of progress, the likes of which we’ve never seen. His nomination cannot be viewed as business as usual and to ensure our Congressional leaders fulfill their duty, we encourage you to call your Senators. 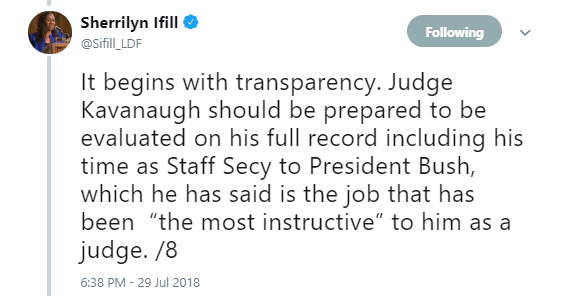 Let them know you believe the integrity of our justice system is at stake if they are not given the chance to review Judge Kavanaugh’s complete record.